Registering the pottery from Alvastra pile dwelling is an interesting, fascinating and enthralling task. However, the material is somewhat challenging to grasp. The material is diverse and comprised of three main groups of different character. So called funnel beaker pottery (FBP) and pitted ware pottery (PWP) are both present at the site; two material groups that rarely occur at the same location. A third group that does not correspond to either one of the more known pottery styles – the pile dwelling pottery (PDWP) has also been found within the wooden structure. 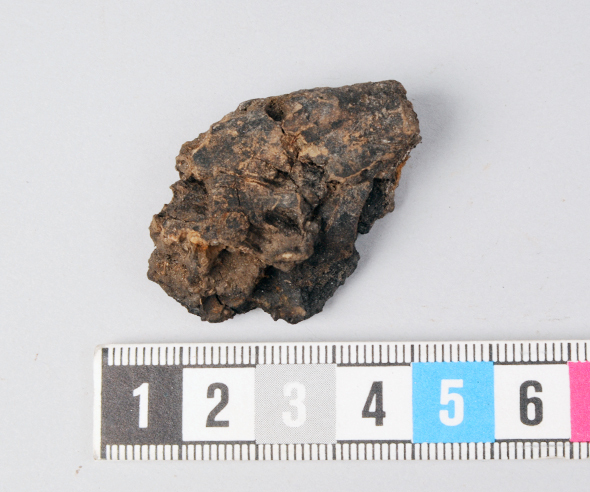 Defining and registering this particular material so that it is represented in a good way in the museum database is sometimes more difficult than it seems. 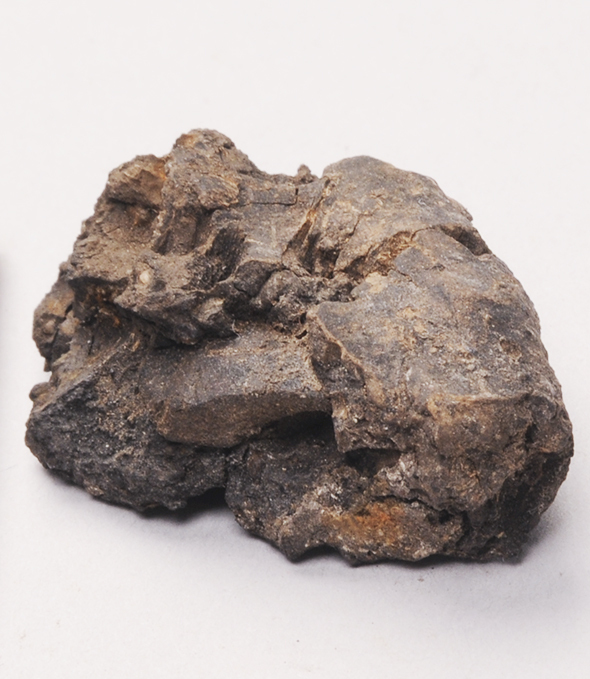 Above: a section of a rim from a pitted ware pottery vessel (FID1185158), shown from the side. Shown to scale below. “The major part of the pottery found at the pile dwelling cannot be ascribed to either the funnel beaker pottery or the pitted ware pottery; it is more likely that the assemblage is inspired by both traditions. It can be described as cooking ware with varying shape, size, décor and building technique. Vessels with a straight neck and a slightly outlined shoulder are present in the material together with vessels with an inwardly sloped rim. The décor consists of simple impressions in one or several rows below the rim and/or below the shoulder. The décor is made with sticks, animal teeth, bone joints and in some cases with bifurcated bone instruments. The décor is never combined with rows and pits. 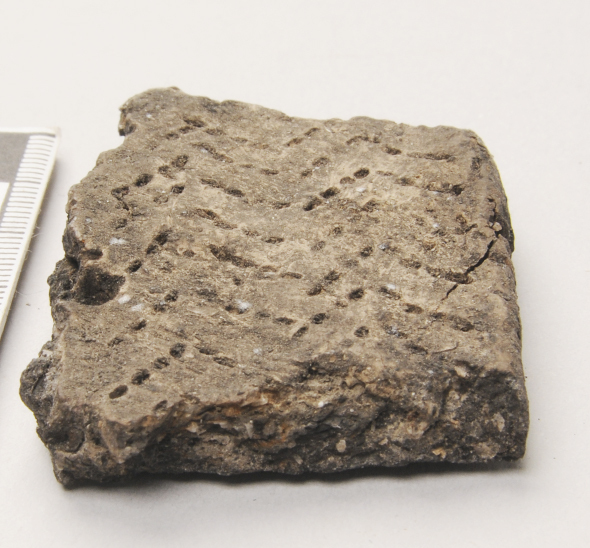 The ware is often thick-walled but thin-walled sherds do occur, both U-technique and N-technique have been used. The pottery is as of yet not defined archaeologically and in the lack of a better name it is referred to as “pile dwelling pottery” by the author; this to separate it from the more classic funnel beaker pottery and pitted ware pottery found at the site“ (Browall 2011:289). What I have found is that when comparing the three materials, the PDWP is thick-walled and not as finely worked as the other two assemblages. At the moment it is perceived as if the more time-consuming aspects of producing the vessels, i. e. working the temper into the clay, joining the clay coils together, shaping the vessel and preparing the vessel surface has been made with a lesser attention to detail. On the other hand decorating the vessels seems to have been given more time during production. 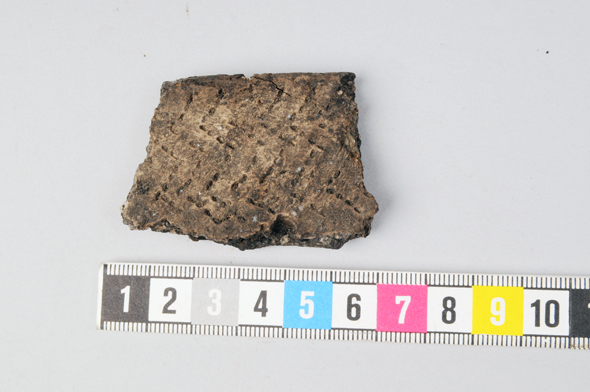 Above: a section of a rim from a pile dwelling pottery vessel (FID1185271), shown from the side. Shown to scale below. It is worth mentioning that the short time spent on making the pottery is by no means indicative of a primitive craft tradition. The traits of the PDWP noted during the process of registering the material is merely an observation at this point, and may or may not have to do with the skill of the potter. These observations are at this point interesting to have in mind when registering the finds from the pile dwelling. Hopefully we will understand more about the enigmatic PDWP and the specific traits that are connected to the material as the project continues. Upside down or the right way up?